Work clothes, kids clothes, soccer clothes, towels, sheets and on and on. This makes up some of the never-ending chore of laundry. I am probably in the minority but I actually don’t mind doing laundry. I think it may be because I love it when something dirty or a mess and then becomes clean. It is kind of like when you put on a fresh coat of paint and it looks great – clean and unblemished (for a moment at least). 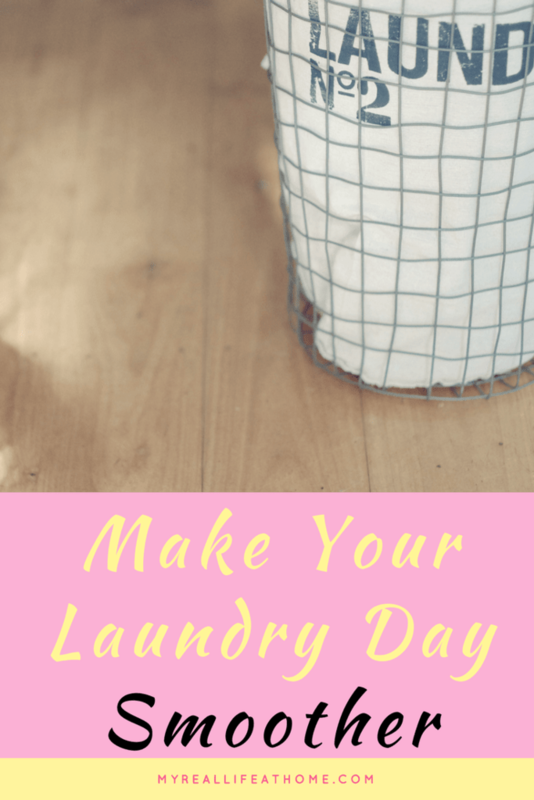 I am going to share some of my best laundry tips with you. My hope is that maybe they will help you enjoy laundry a little more. Okay, maybe that’s expecting a lot – I hope they will help you dread laundry a little less. My first tip would be to get your laundry organized. I find that if I keep my laundry sorted on an ongoing basis, I get less overwhelmed. I am lucky enough in our current home to have laundry chutes. LOVE THEM!!! This helps with keeping our room cleaner since we just throw the clothes down the chute at the end of the day. Also, it’s easy to have the kids get their laundry downstairs too. It’s a definite benefit, however, what you don’t see is the pile of laundry on the basement floor. Our last house did not have laundry chutes but what I found worked great was using a 3 compartment hamper. I used the 3 compartments to separate our laundry into lights, darks, and delicates. Having the laundry sorted ongoing saved me a step as I didn’t have to do it when it was time to wash. Also, I could easily see when I needed to do laundry. 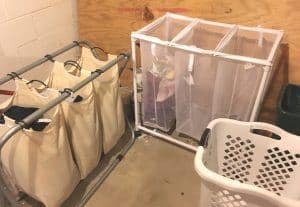 I have single hampers in each of the kid’s room so they can keep track of their own laundry and easily bring it to the laundry chute. As with our room, this helps to keep their floor clean (when they use it). In addition, I also have one in the kid’s bathroom for clothes and towels that don’t make it out of the bathroom. I know….that’s a lot of hampers. I may have a problem. Our laundry area is in the corner of the unfinished part of our basement. Another tip would be to set up your laundry area to have whatever you need within arms reach. 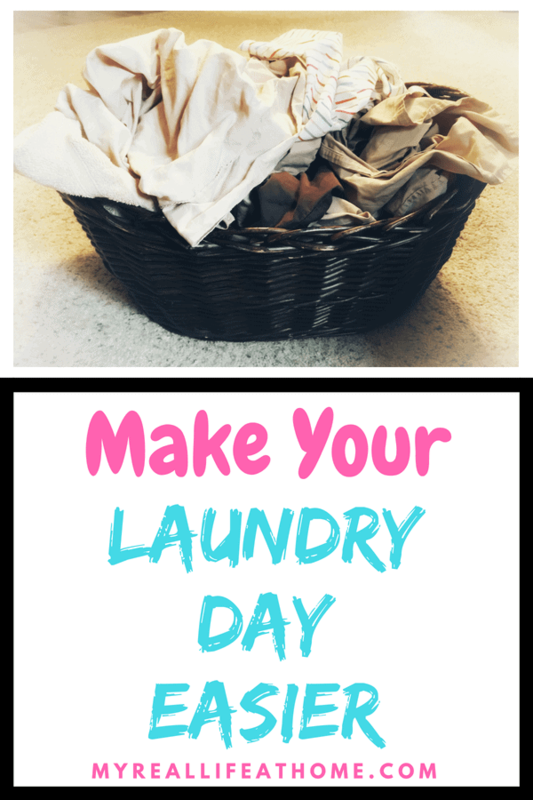 If you have a separate laundry room this tip is probably a lot easier for you. For those of you who are like me and are doing it in your unfinished basement, don’t worry, you can’t make it work. I would suggest a set of shelves to store your supplies. They don’t need to be pretty, just something to do the trick. I have a plastic set of shelves that are easy to clean and move if needed. If you looked at mine right now, you would see detergent, fabric softener, dryer sheets, stain spray, washable bag for delicates, garbage bags and other miscellaneous things. Figure out what you use and find some shelves that will easily store those items. Another part of my laundry area is my hampers. Yes, more hampers! I have the 3 compartments hamper that we no longer need in our room because of the laundry chute, as well as an additional 3 compartment hamper. As I mentioned, the first hamper is used for lights, darks, and delicates. I use the other hamper for towels, sheets and kids clothes. 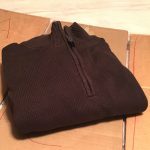 Figure out what your main clothes uses are and how many compartments you need. You may need more or you may need less, just find what works for you. Like I mentioned before, having them sorted as I go saves me time and stress. It can be incredibly overwhelming to see a huge mountain of clothes. I have another section with foldable drying racks. I personally do quite a bit of delicate and hand wash items that can’t be machine dried. Living in Ohio, I am not able to dry clothes outside year round, so this is my solution. As an added bonus, our basement came with ropes to use as clotheslines. I hang my husband’s button up shirts on hangers to dry. This helps eliminate wrinkles and I can even get away without ironing some of them! That’s a victory for me! Finally, I also store my iron and ironing board in my laundry area. I found this wall mounted iron and ironing board holder. (You can find a similar one on Amazon) I had my husband hang it up for me and it works perfectly to keep everything out of the way. I love when everything has it’s own place. I find it easier to clean and organize when I know where things go and I don’t just shove it wherever I can find a place. That mindset definitely works best with my kids too. They clean up their rooms and toys much better when they know where they go. Stains usually end up being my most annoying part of laundry. It’s so frustrating to put on clothes and realize there is a stain. For grease stains, I have a great home remedy. It’s simply Dawn detergent and you can read about it here. Obviously, if you know there is a stain, try to treat it before washing. I either use Dawn or a good stain spray, like Zout (you can find at your local store or Amazon). You will want to treat the stain, rub it in and let sit a few minutes before laundering. With Dawn, I have rubbed, rinsed and let sit for few days without any issues. I think folding is probably where a lot of people dread laundry. Again, I don’t actually mind this part. I usually grab my basket of clean clothes and bring the upstairs. I turn on my TV, use my hand-made folding board and I’m done before I know it. I find that if you distract yourself, it will go by faster. 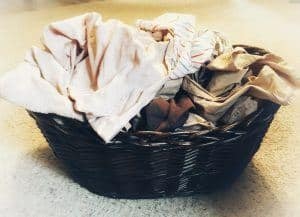 Putting the clothes away when finished helps me feel like I accomplished my task and I don’t have to see a basket of laundry sitting on the floor – even if it is clean and folded. I think my biggest tip may be to just keep at laundry. Don’t let too much pile up or you may get overwhelmed. With your clothes already sorted, it’s easy to throw a load in even if you only have a couple minutes. I try to get a load in before I take the kids to school or before dinner. Just fit it in whenever you can and don’t get discouraged. I’m not perfect and there are definitely times when I have washed the same load more than once because I forgot about it and didn’t get it in the dryer in time. Just keep at it and soon you will have a routine. 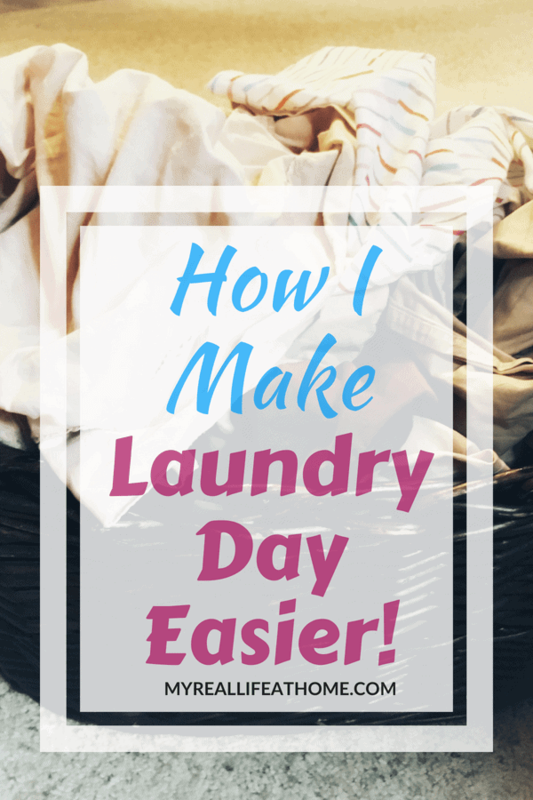 This is what works for me and I would love to hear your best laundry tips and what works best for you. If you have any questions, please leave them in the comment area below and I would be happy to get back to you. Some great ideas in this post! 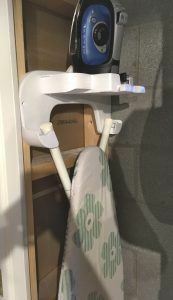 I have an ironing board that attaches to my laundry room door and pulls down when I need it. It’s so convenient! That’s a great idea and perfect if you are short on space. Awesome post. Ib e gotten so lazy with my laundry, but am trying to do better now. I haven’t separated clothes in years, but I plan on starting and I’ve even purchased a steamer as well. Thanks for the tips! Best of luck in doing better with your laundry! They definitely come in useful! Great tips!!! Laundry is one of my least favorite chores. It’s funny how we have all that household chore that we dread. I absolutely hate doing laundry, but I completely agree with having it within arms reach. My laundry is on the first floor and I keep up with it much easier. I would love to have first floor laundry. I have to admit there are nights when I realize I forgot to switch the wash to the dryer and I decide I’ll just wash it again the next day instead of having to walk to the basement! I especially love the tip on keeping yourself distracted while folding. I don’t mind sorting and washing, but I tend to procrastinate on the folding. This is the perfect time to catch up on Netflix shows I ordinarily wouldn’t make time for. Distraction is definitely a key. I actually just finished folding a basket of clothes that had been sitting for a couple days. I wish I hadn’t procrastinated in folding it because some of my shirts were extra wrinkly but I got it done quickly as I watched some TV. These are some fabulous tips for the rest of us! Thank you. So glad you found the laundry tips helpful. One of my goals is to try and help others with the mundane house chores. Fortunately for my family I really enjoy doing laundry. 😊. Great list of tips. That’s awesome that you enjoy doing laundry. 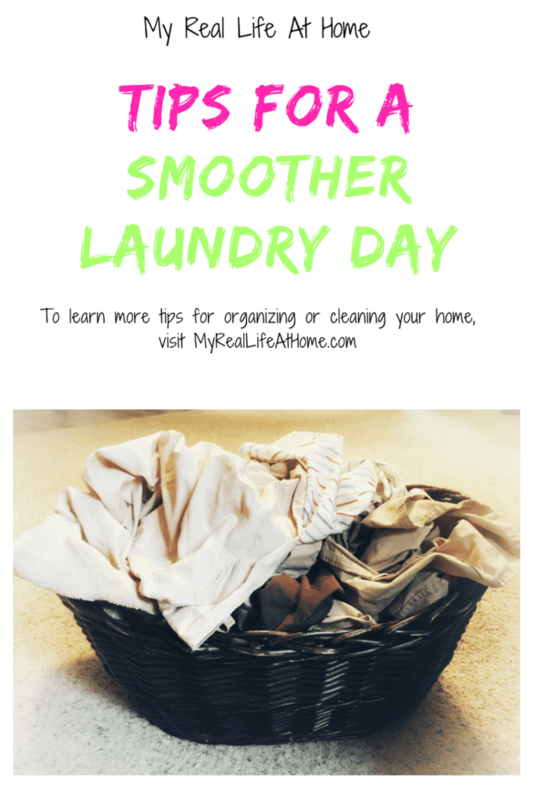 If you have any additional laundry tips, I would love to hear them. Really helpful tips, Julie! Laundry is my nemesis but I’ve found that having it organized somehow makes it less of a pain. I think being organized is definitely a large part of the battle of laundry. As long as we have control over the laundry, it is easier to not get overwhelmed by it.